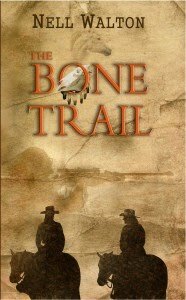 The Bone Trail is a mystery thriller inspired by actual events involving wild horses, a gold mining company and the Bureau of Land Management(BLM). Wild Horse advocates Lindy Abraham and Julia Evans are frustrated with the BLM's efforts to keep them from protecting the Wild Mustangs of Nevada. They are at constant war with the government officials who are supposed to help the horses but instead, pave the way for mining companies to take more land for their mining purposes. When that occurs, the wild horses that roam the land are relocated, while some may go to ranches for adoption, most are sent to slaughter houses to be sold as meat overseas where it is considered a delicacy. Lindy and Julia have had enough and decide to do some investigation of their own. What they find appalls and dismays them when they stumble upon an enclosure filled with wild horses in different states of death. They film the horrific events on video, hundreds of horses are either dead or dying however, before they can share with the world what the BLM is allowing to happen, they go missing. Kate Wyndham, investigative journalist and horsewoman, is asked to find out what happened to the two women. With great apprehension, she had recently lost her own horse and her pain was unbearable, she begins her research and follows the clues to the events that lead to the disappearance of Lindy and Julia. Along her journey she enlists the help of Jim Ludlow, a local rancher and a Shoshone horse whisperer, a recovering alcoholic whose marriage recently disintegrated. Together the two uncover the truth and find love along the way. I like how the author, Nell Walton, used humour in the story. The blend of both the horror of the situation and the chuckle humour dispersed throughout the book gave The Bone Trail a natural balance. I liked that there wasn't a lot of play between Jim and Kate before they came together, many books get bogged down with that interaction and if I wanted it, I would pick up a Harlequin, in life, instant attractions almost never drag out. I would've liked to have seen more from the mining company and BLM officials, I think adding some of their seediness to the book would have given it an extra edge that would of only given more credit to the issue of Wild Horse advocacy. The Bone Trail is heavy in expletives and the horse scenes may be disturbing for some but the book is a great read and I would recommend to anyone who has a love of horses. The Bone Trail is a story of love, loss and murder set in modern day Nevada. While searching for a clandestine wild horse roundup, two wild horse preservation advocates have disappeared in the desert without a trace. When journalist Kate Wyndham and Shoshone Native and horse whisperer Jim Ludlow set out to discover what happened to them they find themselves caught up in a web of deceit, intrigue and corruption that threatens everything they hold dear and may even claim their lives. I sure hope this book is on kindle because I really like how it sounds. Just my kind of book.